Two royal letters arrived the other day, both from reigning Queen for the birthday wishes I sent. The first letter is from Queen Elizabeth. 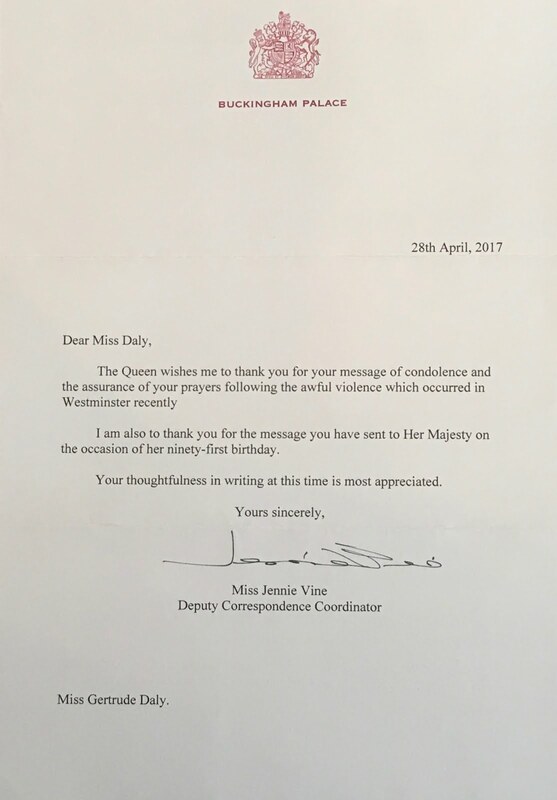 I had written to her in April for her 91st Birthday. I had of course also mentioned the recent Westminster Attack. The letter is similar to the one's I have received from the Queen in the past. 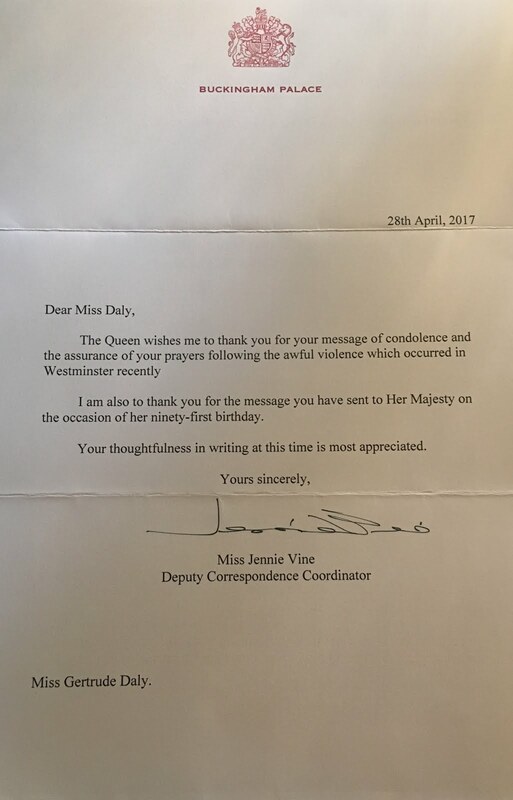 But what is interesting is this was written by Miss Jennie Vine, a Deputy Correspondence Coordinator at Buckingham Palace. This is the 1st time I've gotten a letter from the Queen that was signed by someone other than a Lady-in-Waiting. I think the Ladies-in-waitings handle more of the good wishes and the correspondence office staff the more serious or official letters. The correspondence office staff do the more day-to-day stuff, as they are working full-time at answering letters. For the Ladies-in-Waiting answering letters is one of the many tasks they do for the Queen. The 2nd letter is from Queen Margrethe of Denmark. I had written to her last month for her 77th Birthday. This was the 1st time I have written to Queen Margrethe for her Birthday. But I have written to her and Prince Henrik for Christmas and received a similar response. Unlike the two Christmas replies I have gotten from her, this is a basic form letters, that they printed out for everyone. Nothing personal. One of the Queen's Aide-de-camp just filled in my name and signed it. The Aide-de-camp's name is not printed on the bottom. This is usually done so that any of Aide-de-camp can use this reply. Aide-de-camp is a French term that translates to Aide-in-camp. It is a Junior Military officer who serves as a personal assistant or secretary. Hey ... I had sent a letter to Queen Elizabeth II on the occasion of her birthday in April from India. I haven't got a reply yet. Should I expect a reply ?? Don't worry it will come. It just takes them a while to send out all the replies to everyone who has written. 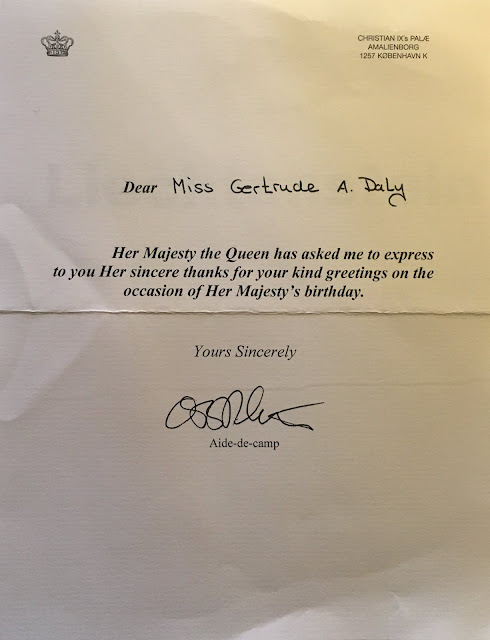 It's very common for them to take weeks or months to reply to everyone for the Queen's Birthday, especially as some are writing for her birthday in April and some for the official birthday in June. Last year for her 90th (which obviously had a lot more letters than most years), I got my reply in November! Got one from Denmark. Signed by the same person. I hope heq majesty got the comemorative i sent it with.